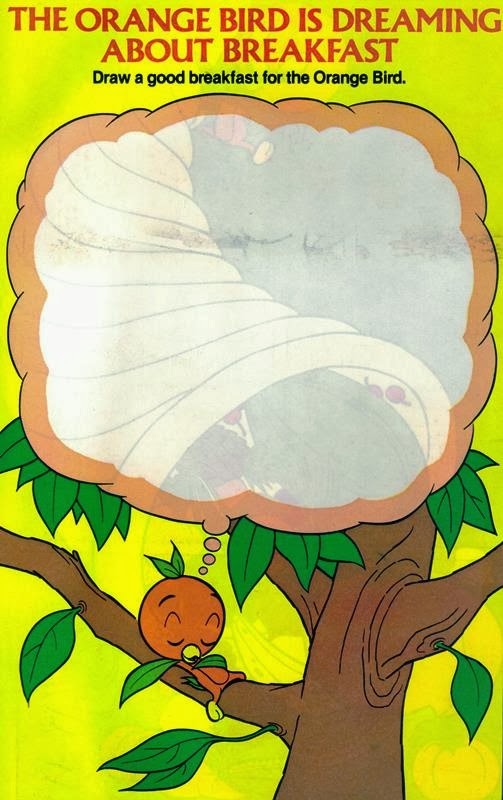 When The Orange Bird flew onto the scene in the late 1960s, he could be seen far and wide in Florida. He wasn’t just a part of a song, or a character that would appear in the Magic Kingdom a few short years later, he was the living embodiment of Florida citrus. To this end he appeared in television ads, billboards, at citrus stands, and in all sorts of printed materials. One such piece of promotional ephemera was this 1980 comic book. 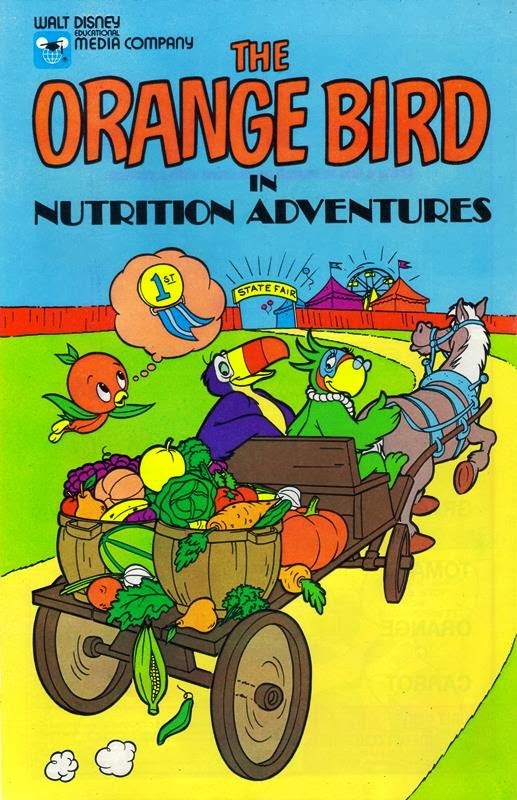 In The Orange Bird in Nutrition Adventures, the little Orange Bird works on a farm, takes a day off to go sailing, and enters the State Fair with his friends Macaw and Toucan. There are discussions all throughout the comic about the benefits of healthy eating. From a breakfast of donuts or oatmeal to snacks on the high seas and the benefits of vegetable gardening, the stories always come back to food and hunger pangs. There are also activities that occupy the inside of the front and back covers. The front lesson is a simple matching exercise, from the name of a healthy food to a picture of the food. The back activity, however, leaves room for readers to be a bit creative, as they draw up a healthy breakfast for the Orange Bird. What kind of breakfast would you draw up for the little Orange Bird? When you get to Anandapur in Disney’s Animal Kingdom you may decide you want to stick around a bit longer or take an expedition into the jungles of the kingdom. To extend and enhance your stay in Asia you’re going to need a travel company that knows the area, right? As it just so happens, Kshana Travel Company is conveniently located just across the way from Yak & Yeti Local Foods and next door to the Royal Anandapur Tea Company. Okay, you caught me! You can’t stay overnight in Anandapur, and the expeditions are as simply as walking down a trail or moving through a queue, but there is a piece of the Kshana Travel Company that ties the land together. Kshana is actually the home to the land’s DVC kiosk and the Kids Discovery Club, mounted on the wall, however, is a map of Anandapur. Does that map look familiar? 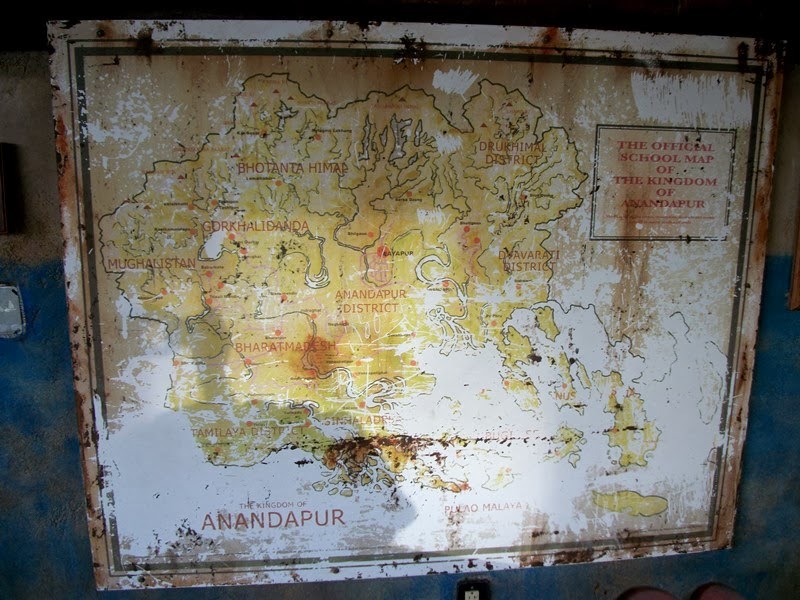 You can see a blueprint copy of the map, which shows the Kingdom of Anandapur, in the queue of Kali River Rapids. The map shows up again further down the line, in the last room just as you make a decent to the raft loading area. 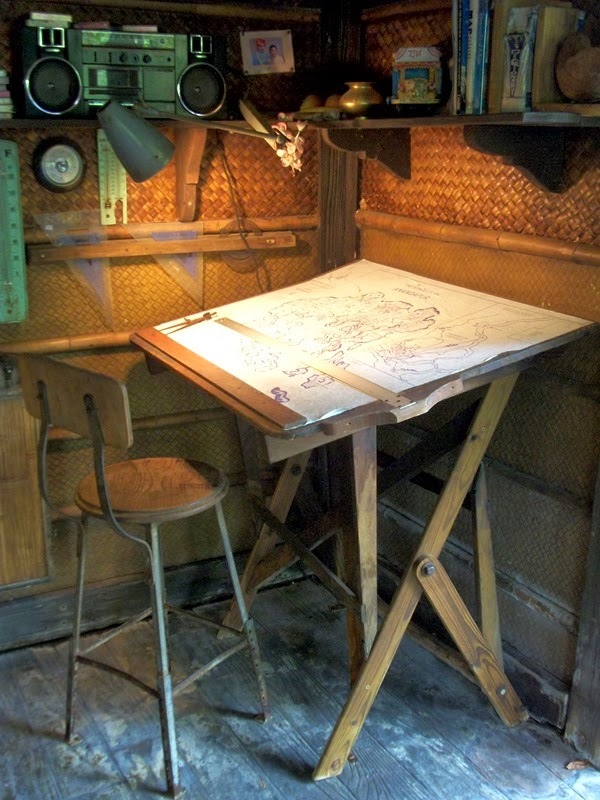 This time, however, we are in the cartographers office where he is actually in the process of creating the map. While there may be a few changes between the drafting and final renditions, such as title location and an additional close up section of the map, it is clear that these maps are one in the same. Anandapur’s land to water ration may change a bit in the rainy season, but it’s nice to see that someone loves the area enough to want to capture it, and all its river bends on paper! When The Hollywood Brown Derby Lounge opened last year at Disney’s Hollywood Studios it did so under that mantra of, “The Place to See… and be Seen.” If it’s true that you want to start seeing stars you could venture down Hollywood Boulevard and hang out with some of the Citizens of Hollywood or try one of the lounge’s classic cocktails. Of course, for those of you that want the best of both worlds you can always try one of their signature cocktails, each named for a particular citizen of the Hollywood streets. Jack Diamond is the persuasive talent agent that wanders Hollywood and Sunset looking for the next big star. To help fill his days, Jack has developed a talent of being able to show off a little sleight of hand or shell game and perform the occasional magic trick. At The Hollywood Brown Derby Lounge the Jack Diamond is comprised of Maker’s Mark Bourbon, Sweet Vermouth, and Bitters. For those familiar with the bartending arts, just as fine an art as, say, magic tricks, this is a classic Manhattan. Let’s say, however, you are far away from Disney’s Hollywood Studios and The Hollywood Brown Derby Lounge, and you’d like to feel like you’re back in the sunshine and rubbing elbows with the Citizens of Hollywood. What could you do? Well, you could make one for yourself. 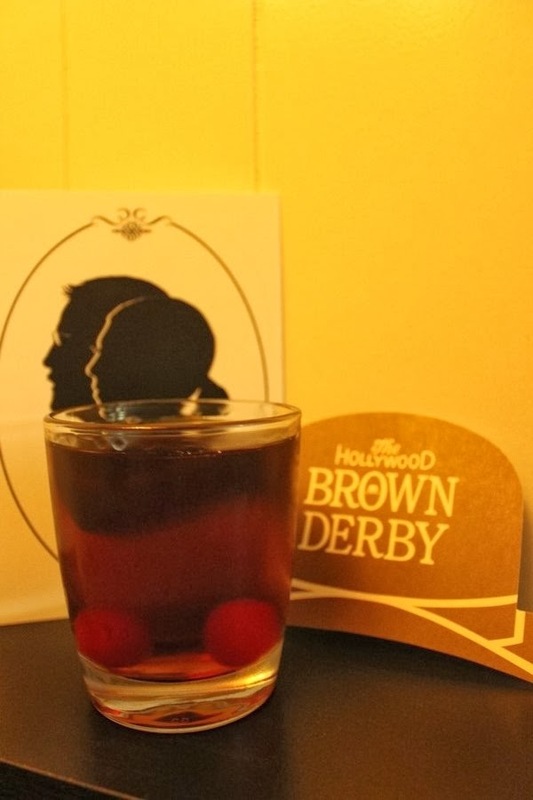 A Manhattan is typically served in a martini glass, but at The Hollywood Brown Derby Lounge the Jack Diamond is served in a rocks glass, a smaller version of a highball glass used for an old-fashioned or shots on the rocks. Hence the name. It can be stirred with ice and strained into the glass, straight-up, or served over ice. Garnish for the Jack Diamond is a pair of maraschino cherries. If the ingredients list makes you think the Jack Diamond might be a bit strong, you would be correct. You will get a strong taste of the bourbon, which is mellowed a bit by the vermouth and given a kick by the spiciness of the bitters. Mix yourself up a batch of these, throw on a fedora if you have one, and settle in with The Public Enemy or Casablanca. You’ll feel like you are stargazing at The Hollywood Brown Derby Lounge in no time! 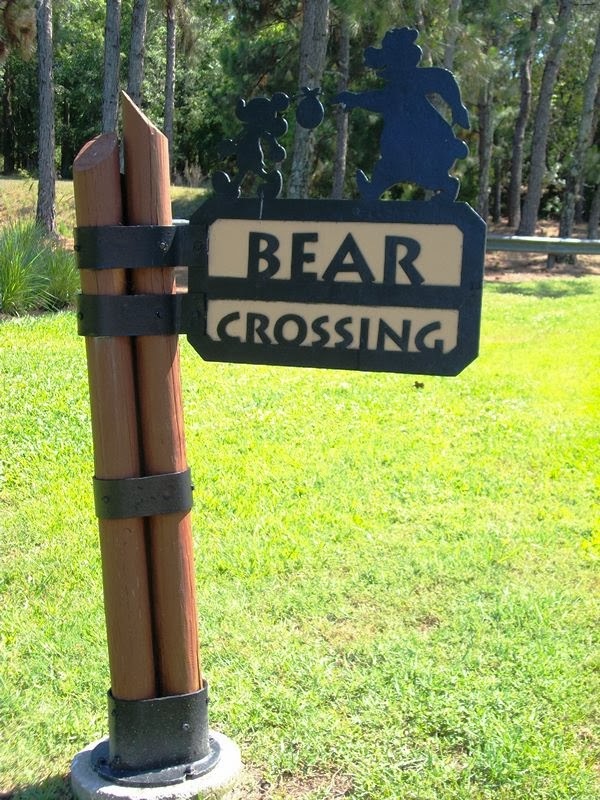 Have you ever wanted to save money at Walt Disney World, but hated the idea of having to do a lot of leg-work trying to find the best rate, deal, or way to plan your trip to get the most bang for your buck? Then you are definitely one of the 102! Or rather, you would be wise to check out Lou Mongello’s newest project, 102 Ways to Save Money For and At Walt Disney World. The book is available as both a traditional paper copy and an ebook, and Lou was gracious enough to forward a copy over to me to see what I thought of his latest gift to the Disney community. Let’s start with the basics, shall we? 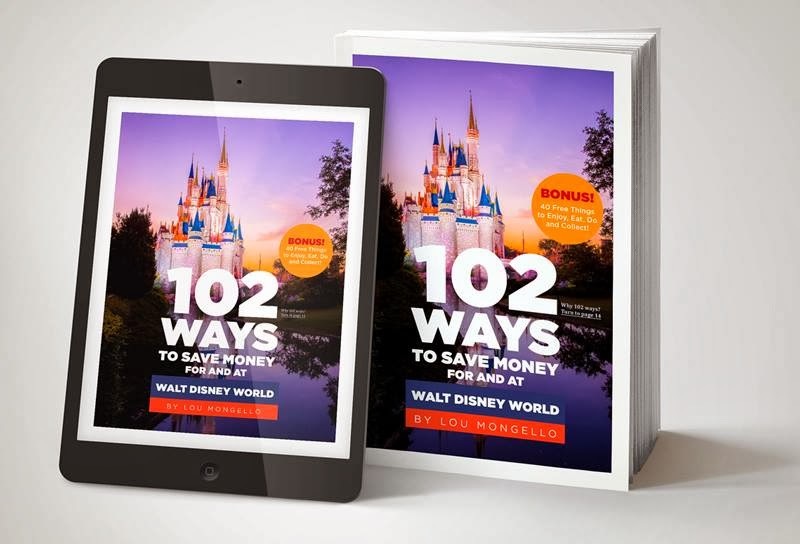 102 Ways weighs in at almost two hundred pages and rarely does a page get flipped that doesn’t include multiple ways to save, spend, and have frugal fun at Walt Disney World. The book opens with Lou’s guarantee, which also serves to offer up his first piece of advice, “Your goal should not be to use 102 strategies in the same vacation.” The guide offers plenty of strategies, but trying to cram everything into a single trip will create a taxing planning scenario and a trip that will push the boundary of what you could define as family fun. From years of experience, Lou inherently knows this to be true, but rarely do you see a travel writer openly express that moderation in a trip is how you can create lasting family memories and even have fun while planning. 102 Ways offers up a variety of thought processes that you may not have consider. Sure, plenty of guidebooks tell you how to get there or how to get around while you are there, but 102 Ways walks you through the entire process! From planning before you get there, how to save, pack, and plan/make your souvenirs, to when to go, how to get there, and what tickets are perfect for you. Once you’re there Lou touches upon all things edible, from snacks you can pack to those celebratory meals, shopping for souvenirs, and all the stops in between, up to and including what to throw in your back pack. So, Lou has given you a lot to chew on with how to get there, how to save and spend, and how to make the most of your days in Walt Disney World. All of which begs the question, what’s left? Turns out, plenty! 102 Ways has a secret of its own, turns out it should actually be called 142 Ways, or maybe 1,002 Ways would be more apt for all the uncounted insights Lou has given to readers. The bonus 40 points provided gives you a ton of free things to do, see, and collect while you are vacationing in Walt Disney World. It is here that Lou hands out my favorite piece of advice that I am always passing out myself, and something I make time for on almost every single trip, the sing-a-long and campfire at Disney’s Fort Wilderness Resort and Campground. All in all, when it comes right down to it, I would recommend 102 Ways to Save Money For and At Walt Disney World to anyone. Whether it is your first trip you are planning or you happen to be looking for that one thing to make your one-hundredth trip just a bit more affordable or magical, Lou Mongello has you covered. Do yourself a favor and picking up 102 Ways just as soon as you have a chance, and then get started planning your next trip to the Vacation Kingdom!